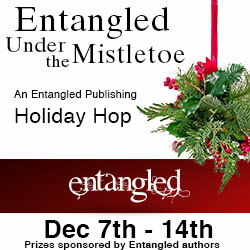 UPDATE: THE WINNER OF MY GIVEAWAY FOR THE ENTANGLED UNDER THE MISTLETOE HOLIDAY HOP WAS LUCY FELTHOUSE! CONGRATULATIONS LUCY! Yep! It's finally here, the HUGE Entangled Under The Mistletoe Blog Hop which sees over fifty authors giving away a ton of goodies just in time for the Christmas holidays. Don't forget to check out what the other authors participating in the hop are giving away! It's been a brilliant but bonkers year for me and now I need to recharge my batteries. So if I don't post again before 2013, I'd like to wish you all a very merry Christmas and a sparkly New Year.